TUSCANY, Italy -- Tuscany? Golf? Surely Leonardo da Vinci didn't invent that, too. Well, no, we'll leave golf pioneering to the Scots and, okay, the Dutch. But Tuscany, at the very center of Renaissance Italy, doesn't want to be left out in any tourism countback, and last year it was delighted to be designated No. 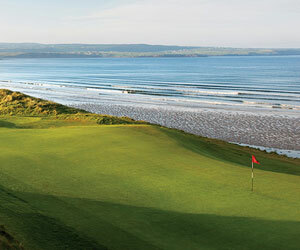 1 emerging golf destination by the London-based International Association of Golf Tour Operators. By straight tourist standards Tuscany is up there in the world's super-league. Italy's fifth biggest province, it has at its northern heart the incomparable city of Florence. Duomo, Uffizi Gallery, Accademia, Michaelangelo's David, Ponte Vecchio, 42 museums, a dozen churches, 13 notable landmarks - it is a vast gallimaufry of art, architecture, style and humanity. Siena and its unique horse-racing Palio in the south, and Pisa and its famous Leaning Tower on the Ligurian coast, are yet more must-see cities. Who hasn't heard of Chianti, Tuscany's central province? Who hasn't tasted its grape? But wait. There's all this humanity, isn't there? Tourists by the thousand, especially, in the big cities in July and August. So, how to have some peace? How, too, to enjoy backwoods Tuscany - dreamy countryside, castellated hill, tinkling valley, cypress and oak coppice, sunflower field and vineyard. One of the best answers? Golf! Around 25 years ago, Costantino Rocca, gave up packing polystyrene boxes in his native Bergamo to become a caddy master. At St Andrews in 1995, a 60-foot putt forced a playoff with America's John Daly which he went on to lose. But Italian golf was up and going, and Rocca beating Tiger Woods 4 and 2 in the 1997 Ryder Cup at Valderrama did not hurt. Not Inter-Milan or Juventus winning the European soccer Champions' Cup, for sure, but lonely golfing outposts like Ugolino, in the hills just south of Florence, opened up by British expatriates in 1889, suddenly found themselves joined, one by one, by courses boasting designer names like Arnold Palmer. Now comes a Tuscany thrust for golf visitors. There are nine 18-hole courses on which its tourist people base their hopes. By Algarve or Andalusia standards they are scattered, and best done in bunches. For example, around Florence, Poggio dei Medici, frequent home of the Italian Ladies' Open, Arnold Palmer's La Pavionere, and the venerable Florence venue of Ugolino; half-way to the Ligurian coast, Montecatini, near a resort beloved of Verdi and Leoncavello; Castelfalfi, close to a hilltop medieval hamlet; and, along the Ligurian coast south of Pisa, Cosmopolitan, Punta Ala and Golf Toscana. Tuscany has muscle as well as beauty. It is the fifth largest Italian province, bounded by the high Apennines to the east and the Ligurian Sea to the west. The central regions of Mugello, north of Florence, and Chianti, south of it, have long held an appeal for visitors loving the culture, gastronomy and friendliness of their Italian hosts. But in the nature of late-developing golf travel, few American and British have so far penetrated the hinterland, and played the beguiling courses created there. Most golfers have driven from Scandinavia, Holland and Germany. The British, in slowly increasing numbers, are using low-cost air tickets in to Florence and Pisa. Fair enough, relatively few Italians play - around 70,000 on about 100 courses - but course design and green keeping are of a very worthy standard. Florence is a small airport, and a hire car will quickly whisk you north toward Bologna on the nearby Autostrada 1 and via the Barberino turn-off on country roads to the Sonesta Resort Tuscany, which incorporates one of Tuscany's best-known courses, Poggio dei Medici, in Mugello province. Poggio was opened in 1992 to the design of the Italian champion Baldovino Dassu and architect Alvise Rossi Fioravanti. "Hill of the Medici", the course's strict English translation, is about the half of it. Holes shrewdly set in sand, lake and rough over two ridges and three valleys offer a test of skill, stamina and mental strength. You know what it's about with three par fives over the first six holes. Handily, the average 18-handicapper gets a couple of extra shots on a slope rating of 131. And that's off the yellows! Off the whites, par is 73 and length 6,338 meters. July to August is low season in most terms, thanks to the heat and Italian life style, and spring and fall the most popular golfing times. But many British at Poggio dei Medici, uninfluenced by Noel Coward (no golfer he!) were out in the midday sun, clearly fancying the uncluttered course. The thunderstorms were another matter. Two at most in August, we were told. Sirens of commercial strength at most of the courses suggest the truth. It's the chance you take at this time of year. At least, it's always warm. The Sonesta has teamed Poggio with La Pavoniere and Ugolino for reduced-rate golf, and we plan the next day's visit to Le Pavoniere, near the city of Prato. After a set of roundabouts in undistinguished suburban countryside - Prato, famous for textiles, has a centre almost as imposing as that of Florence - there is an unobtrusive sign to the gated Le Pavoniere. It's hot, and so is the course with a slope rating of 137 off the yellows. This is a place of 1,000 members of whom 160 actually play. Which speaks well of its bar and restaurant, though an August Friday is clearly a quiet time for the course, opened in 1986. Palmer came here on an extended stay, the course secretariat tells us, and there's no doubt about the master's American design style in terms of water hazard - the par-4 15th of 339m to a raised green, is surrounded by it in a vast horseshoe. A factor 25 sun cream repellent helps keep the flies off as you battle your handicap along fairways variously threatened with dogleg, slope, sand, water and bulrush to ample greens of deceptive contours. The 5,800 metre, par-72 Ugolino, started by British emigres in 1889, was recreated in 1933 from the hilly terrain south of the city, and, though a buggy is recommended, its design is better suited to a shorter-hitting game. The early holes are a test of sidehill technique, and although the par 3s are longish, the par 4s require thought rather than strength. There's fairness and clarity to the design, though there are few unpleasant surprises to the bunkers straddling green approaches. Good wedge play must alternate with pitch and run. The Florence-based Consorzio Toscana Golf, which is affiliated to IAGTO, is a separate partnership of hotels and courses with tee-booking facilities and discounts at five 18-hole venues closer to, or beside, the Ligurian Sea coast. Two of them are in hilly countryside between 30 and 45 minutes west of Florence. North-west off the Pisa autostrada, Montacatini Terme is a thermal resort famous from Roman times. It lies up narrow lanes to a clubhouse pleasingly hospitable in all respects. A shady terrace invites alfresco food and drink. To the south, spectacularly, lies a Tuscan landscape that includes the village of Vinci, Leonardo's birthplace. The 5,857-metre, par-72 course, open all year, dips and rises in complex patterns, the architect Croze making challenging use of water hazards. Its combination of art and science would surely have pleased Leonardo - and I don‘t mean DiCaprio. Length is less an issue than accuracy, from the 298-metre par-4 opener to the par-3 18th, a daunting 150 metres across a watery chasm. Leonardo would have painted it in depth, even if he hadn't sketched the prototype for the industrial siren which blew us off the green as the heavens opened. Half an hour south, crossing the Superstrada to Livorno, is another of Tuscany's prime 18-hole courses, the par-73, 5,869-metre Castelfalfi, its castle set high above the ninth green. In the 14th century it was a battlefield between Florence and Pisa - Italy, it must be recalled, only came in to being as a united country in the mid 19th century. The course was designed by the Roman architect Pier Luigi Mancinelli in archetypal Tuscan countryside, sunflower fields boldly contesting the folds of green, cypress trees like exclamation marks, and clumps of oak and umbrella pine enclosing greens of good pace and contour. The Ligurian coast 60 miles west of Florence presents another set of courses to be enjoyed in a beach context. Cosmopolitan, a few kilometres north of the lively harbour town of Livorno, was designed by Davide Mezzacane as a par-72 over 6,137 metres, in 70 flat, treeless hectares only 500 metres from the sea. In 1993 it well earned the title, "Best new course in Italy." Soon it is to have another nine holes, becoming the only 27-hole complex in the country. The scale of its water hazards and the shallowness of - relatively few - bunkers make it unrecognisable as a Scottish-style links, but most will find it challenging enough on its own terms. The land was once occupied by a film studio, and the domed, modernist clubhouse opening on to a semi-circular pool could be out of a Fellini set. Wide fairways encourage the less experienced, but there's plenty in it for the better player in some tough approaches. An hour's drive south, there is a distinct beach-holiday pattern at Punta Ala, a par 72 of 6,168m set in pine, cork and oak, and Toscana Golf, a 5,442m, par 71 surrounded by Mediterranean shrub, olive groves and vineyards. At Punta Ala, the Italian architect, Giulio Calvasani, ensured there were engaging sea views, most especially on the par-5 seventh of nearly 550 yards - its green defended by six sand traps. A testing course in most respects, the mild climate and sophisticated irrigation system make it playable all year. Toscana, near the small town of Gavorrano, enjoys more distant sea views, to the Gulf of Follonica and to Elba Island, but a golfer might be excused a more immediate attention to water hazards at 12 of the 18 holes. Just down the coastal road from Cosmopolitan, Tirrenia is a 3,030-metre par 39 set in a pine forest, and from the friendliness and bustling atmosphere you cheerfully accept its "best nine-holer in Italy" tag.